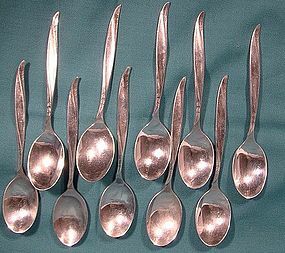 A group of ten 4-1/8" sterling silver demitasse spoons in the Pine Spray flatware pattern, issued by International from 1957-96. These spoons are in excellent condition with no monograms, dents, bends, corrosion, losses, damage or repairs. All items are thoroughly and conservatively graded and all condition issues are noted; all items are vintage or antique and may have slight signs of gentle use. Surface tracked shipping to the U.S. starts at $21 (other spots may vary, air is higher) - tracking and insurance are included in shipping quotes. Items paid with a credit card will be shipped to confirmed addresses only. We do ship internationally. All of our prices are in $US. PLEASE NOTE: we DO NOT accept PayPal, only VISA and MASTERCARD. 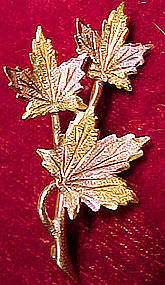 An attractive 1-3/4 x 1" three colour gold pin in the form of three maple leaves on a branch. The leaves are textured and have green, yellow and rose gold; it is stamped 10K, it has a safety catch, it weighs 3.3 grams, and it is in excellent original condition with no dents, bends, corrosion, losses, damage or repairs. All items are thoroughly and conservatively graded and all condition issues are noted; all items are secondhand and may have slight signs of gentle use. Surface shipping to the continental U.S. starts at $7 (other spots may vary) - insurance is included. Items paid with a credit card will be shipped to confirmed addresses only. We do ship internationally. All of our prices are in $US. PLEASE NOTE: We DO NOT accept PayPal. This is a vintage modernist design ring in 10k yellow gold c1950s-60. 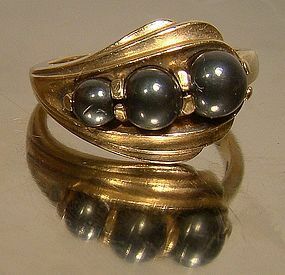 It features three round graduated black Alaskan diamonds (Hematite) in the shape and colour of black pearls. 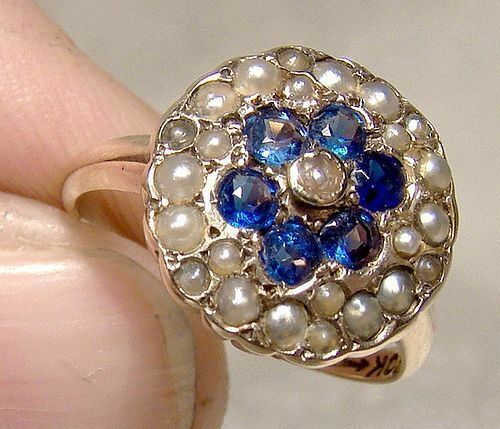 This size 4-1/2 ring is 1/2" across the stones and 7/16" wide. The stones range from 3-5 mm., this ring weighs 3.5 grams, and it is stamped 10K with a maker's mark. It is in excellent condition with no chips, cracks, dents, bends, corrosion, losses, damage or repairs. All items are thoroughly and conservatively graded and all condition issues are noted; all items are vintage or antique and may have slight signs of gentle use. Expedited tracked and insured parcel shipping to the U.S. starts at $22 (other spots may vary, air is higher). Items paid with a credit card will be shipped to confirmed addresses only. We do ship internationally. All of our prices are in $US. PLEASE NOTE: We DO NOT accept PayPal. 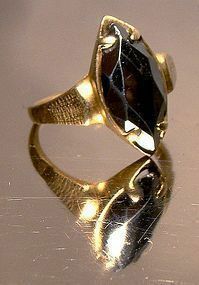 A vintage black Alaskan diamond Hematite ring 1950s-60s. 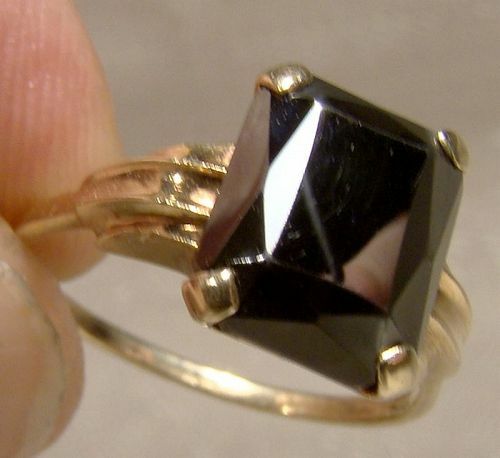 This size 6 ring measures 11/16 x 5/16" across the stone`and it weighs 2.7 grams. 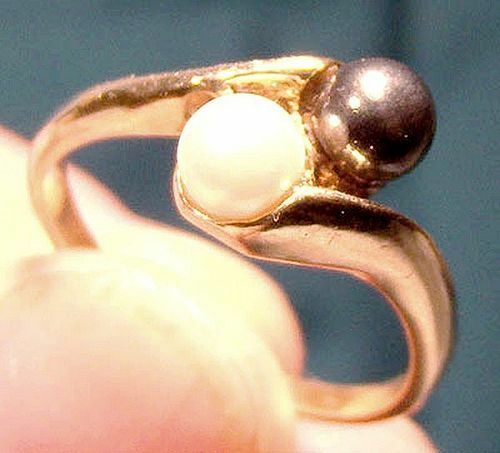 It is stamped 10K and QJ, and it is in very good condition with no cracks, dents, bends, corrosion, losses, damage or repairs other than a very tiny chip at the bottom rim near a claw and an abrasion to one point of the stone. All items are thoroughly and conservatively graded and all condition issues are noted; all items are vintage or antique and may have slight signs of gentle use. Expedited tracked insured post shipping to the U.S. starts at $21 - this includes online tracking, air service and insurance. Items paid with a credit card will be shipped to confirmed addresses only. We do ship internationally. All of our prices are in $US. PLEASE NOTE: We DO NOT accept PayPal, only VISA and MASTERCARD. 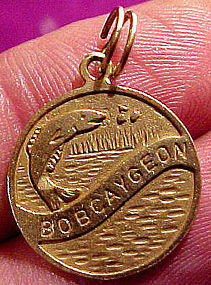 A nicely designed 10K yellow gold 11/16" across charm depicting a lake with a jumping sport fish with BOBCAYGEON on a ribbon banner. It is stamped 10K and it is in excellent condition with no dents, bends, corrosion, losses, damage or repairs. All items are thoroughly and conservatively graded and all condition issues are noted; all items are vintage or antique and may have slight signs of gentle use. Expedited tracked parcel shipping to the U.S. starts at $20 (other spots may vary, air is higher) - tracking and insurance are included in shipping quotes. Items paid with a credit card will be shipped to confirmed addresses only. We do ship internationally. All of our prices are in $US. PLEASE NOTE: we DO NOT accept PayPal, only VISA and MASTERCARD. 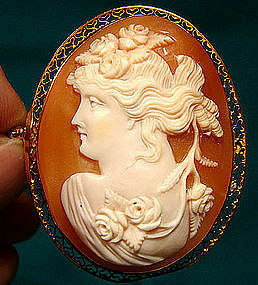 A vintage beautifully carved natural shell cameo with a 10k gold filigree edge and safety clasp c1910-20. This 1-3/4" x 1-1/2" cameo features a classical beautiful woman covered in flowers / roses, most likely this is a representation of Chloris, known more usually by her Roman mythological name of Flora. She is a nymph or demi-goddess associated with flowers and fertility, usually shown draped or garlanded (most often) in roses or other flowers. It is marked 10K on the pin gate-latch safety catch and it weighs 10.1 grams. 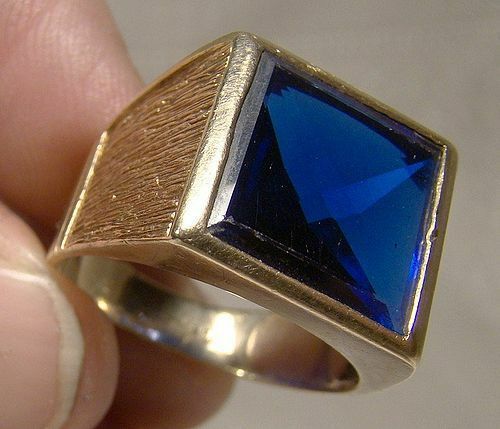 This item is in excellent original condition with no chips, cracks, dents, corrosion, losses, damage or repairs other than a slightly flattened area on the bottom of the gold filigree edge. All items are thoroughly and conservatively graded and all condition issues are noted; all items are vintage or antique and may have slight signs of gentle use. Tracked surface insured shipping to the U.S. starts at $21 (other spots may vary) - insurance and tracking is included in all shipping quotes. Items paid with a credit card will be shipped to confirmed addresses only. We do ship internationally. All of our prices are in $US. PLEASE NOTE: we DO NOT accept PayPal. 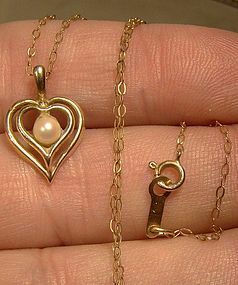 A 10k double heart shape cultured pearl pendant necklace circa 1960s. This vintage elegant 3/4" x 7/16" stamped 10 K yellow gold pendant with a 4 mm genuine cultured pearl comes with a 10k yellow gold 17-1/2" link chain. 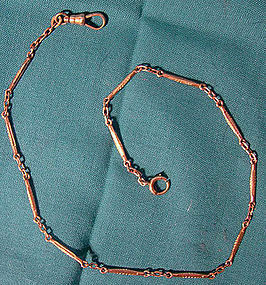 It is stamped 10K and GCC on the spring-ring clasp and it weighs 1.6 grams. It is in excellent condition with no chips, cracks, dents, bends, corrosion, losses, damage or repairs. All items are thoroughly and conservatively graded and all condition issues are noted; all items are vintage or antique and may have slight signs of gentle use. Expedited tracked insured air post to the U.S. starts at $17.50 - this includes online tracking, air service and insurance. Items paid with a credit card will be shipped to confirmed and confirmable addresses only. We do ship internationally. All of our prices are in $US. PLEASE NOTE: We DO NOT accept PayPal, only VISA and MASTERCARD. 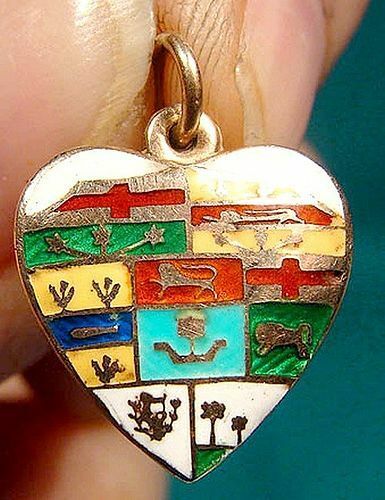 A 10k enamel heart charm with Canadian provinces circa 1900. It has crests of the (then 7) Canadian provinces and this lovely antique yellow gold pendant was made the George H Lees jewellery company of Hamilton ( Ontario Canada) and is stamped 10K with the maker's mark. This piece dates to the pre-1905 era since Alberta, Saskatchewan and Newfoundland are not shown. It weighs 1.4 grams, it measures 5/8" across, and it is in excellent original condition with no chips, cracks, dents, bends, corrosion, losses, damage or repairs. All items are thoroughly and conservatively graded and all condition issues are noted; all items are vintage or antique and may have slight signs of gentle use. Expedited tracked post to the U.S. starts at $21 (other spots may vary) insurance and tracking included in shipping quotes Items paid with a credit card will be shipped to confirmed addresses only. We do ship internationally. All of our prices are in $US. PLEASE NOTE: We DO NOT accept PayPal, only VISA and MASTERCARD. 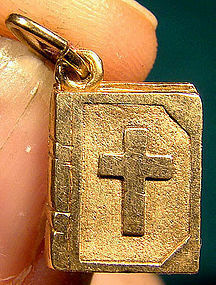 A 10k yellow gold Forstner Bible 1/2" x 3/8" charm or pendant circa 1960s. This vintage 1/2" 3/8" charm with loop is stamped 10KT with the Forstner maker's mark, and it weighs 2.1 grams. This item is in very good vintage condition with no dents, bends, corrosion, losses, damage or repairs. The bale or loop is also 10 K. All items are thoroughly and conservatively graded and all condition issues are noted; all items are vintage or antique and may have slight signs of gentle use. Tracked packet air insured post anywhere in the US is $13.50 (other spots may vary). Items paid with a credit card will be shipped to confirmed addresses only. We do ship internationally. All of our prices are in $US. PLEASE NOTE: We DO NOT accept PayPal, only VISA and MASTERCARD. 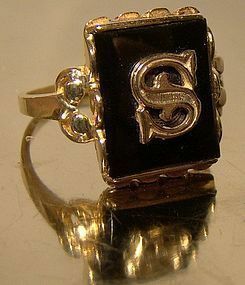 A vintage 10k yellow gold and black onyx signet or initial ring c1930s-50. This size 6 ring measures 5/8" x 9/16" across the setting, it has a screw-mounted M initial and it weighs 2.9 grams. It is stamped 10K with an unidentified maker's mark and it is in excellent condition with no chips, cracks, dents, bends, corrosion, losses, damage or repairs. All items are thoroughly and conservatively graded and all condition issues are noted; all items are vintage or antique and may have slight signs of gentle use. Expedited tracked and insured parcel shipping to the U.S. starts at $22 (other spots may vary, air is higher). Items paid with a credit card will be shipped to confirmed addresses only. We do ship internationally. All of our prices are in $US. PLEASE NOTE: We DO NOT accept PayPal, only VISA and MASTERCARD. 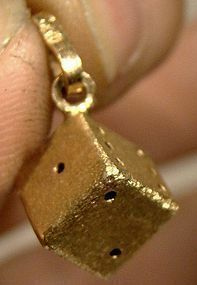 A 5/16" across 10k yellow gold charm in the shape of a throwing die. This dice has a loop and each eye or spot is drilled through. This quality charm is stamped ITALY and 10K on the link and it weighs 1.4 grams. This item is in excellent condition with no dents, bends, corrosion, losses, damage or repairs. All items are thoroughly and conservatively graded and all condition issues are noted; all items are vintage or antique and may have slight signs of gentle use. Tracked packet insured shipping to the U.S. starts at $16.50 (other spots may vary) - insurance and tracking is included. Items paid with a credit card will be shipped to confirmed addresses only. We do ship internationally. All of our prices are in $US. PLEASE NOTE: WE DO NOT ACCEPT PAYPAL, only VISA and MASTERCARD. 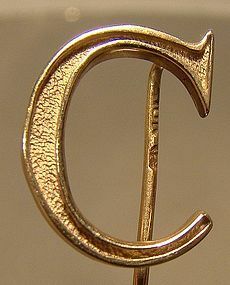 A cool signed Forstner 2-1/8" stickpin in 10k yellow gold with a fancy 5/8" head in the form of the letter C. This pin weighs 1.5 grams and it would make a great gift. This item is in excellent condition with no dents, bends, corrosion, losses, damage or repairs. All items are thoroughly and conservatively graded and all condition issues are noted; all items are vintage or antique and may have slight signs of gentle use. Small packet air shipping to the U.S. starts at $9.50 (other spots may vary). Items paid with a credit card will be shipped to confirmed addresses only. We do ship internationally. All of our prices are in $US. PLEASE NOTE: We DO NOT accept PayPal, only VISA and MASTERCARD. 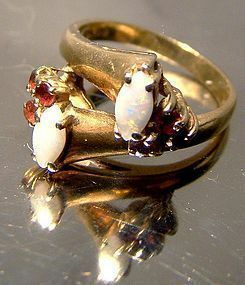 An unusual 10k marquise opals and garnets cross over ring circa 1950s. This vintage yellow gold size 6-1/4 ring features natural opals and genuine deep red garnets. This ring has six claw-set round cut garnets and two colourful natural navatte shape opals. It measures 9/16" across the setting at its widest and it weighs 4.3 grams. It is stamped 10 K with an FJ maker's mark, and it is in excellent condition with no chips, cracks, dents, bends, corrosion, losses, damage or repairs other than a fine surface patina from use on the opals. All items are thoroughly and conservatively graded and all condition issues are noted; all items are vintage or antique and may have slight signs of gentle use. Expedited tracked and insured parcel shipping to the U.S. starts at $20 (other spots may vary, air is higher). Items paid with a credit card will be shipped to confirmed addresses only. We do ship internationally. All of our prices are in $US. PLEASE NOTE: We DO NOT accept PayPal, only VISA and MASTERCARD.